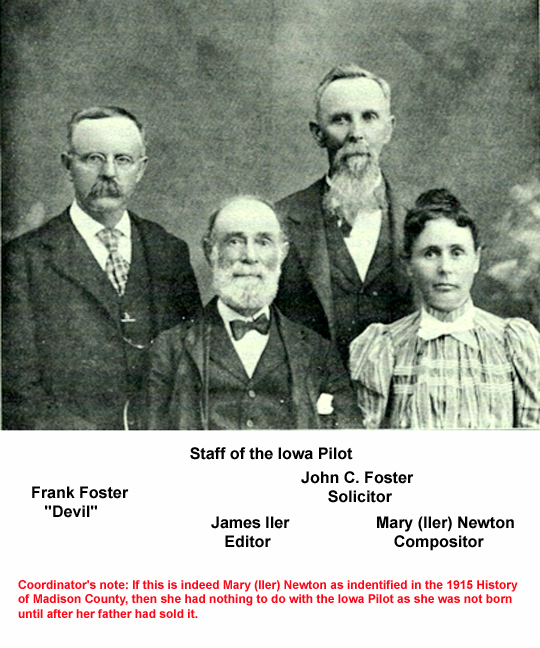 The descriptions of Madison County newspapers below are taken from various sources including the book The History of Madison County, Iowa, vol. I, by Herman August Mueller, 1915, pages 11416 and edited/updated by the County Coordinators. For additional information and a list of available holdings, see the Library of Congress. The newspapers of Madison County do not make a big showing in point of numbers, but in that regard they make up the discrepancy in character and the completeness in which they cover the field of their especial endeavor. The county was not very old when it attracted to the county seat, James Iler, who brought with him from the Buckeye state a small press, fair type and other paraphernalia, with which he set up the first printing office and established the first newspaper in this part of the state. This paper is credited as one of the strongest weeklies in Southwestern Iowa, in point of influence, and it is also one of the oldest. In 1856, James Iler bought a second press and equipment from the Sandusky (Ohio) Register and brought it to Winterset in a wagon. At that time no newspaper had been established between Des Moines and Council Bluffs. When settled in Winterset, he started publishing the Iowa Pilot. Mr. Iler sold the newspaper within a year and the new owner changed the name to the Madisonian. During the Civil War, the paper was renamed the Hawkeye Flag for patriotic purposes and was changed back to the Madisonian ca 1866. The Madisonian is therefore one of the oldest newspapers in the state and the very oldest in Southwestern Iowa. The history of the paper in its establishment, growth and development runs parallel with the growth and development of the state. Its various publishers have invariably been exponents of the persistence, energy and ambition of the community, which has so liberally sustained it, and it has more than kept pace with the growth and progress of affairs. The Madisonian in its early years was a 4 page paper, essentially one sheet, folded in two. In August, 1871, the format was changed to 8 pages. In November, 1871, Col. Cummings, the publisher at the time, decided to print and mail half the paper on Saturday and the other half on Wednesday, thereby making it a semi-weekly. He abandoned this practice after about 6 weeks, probably because of the additional postage costs. At the time, a year's subscription to the Madisonian was $2 including postage. The following persons either in part or whole have owned and published the Madisonian since its founding by Mr. Iler in 1856: John J. Davies, Oliver H. Ayers. Elisha H. Talbot, James M. Holliday, Clarence S. Wilson, Henry Martyn Ewing, E. W. Fuller, Henry J. B. Cummings, S. H. Sringer, C. C. Goodale, E. R. Zeller, Henry Wallace, Homer Thompson, Albert Strong, Fred Strong, S. D. Alexander and the present owner and publisher Ed. 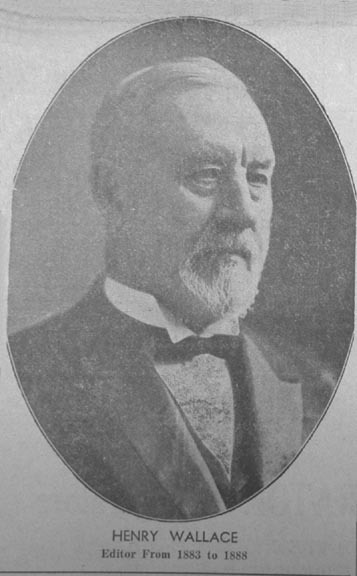 M. Smith, who has been associated with the paper since 1899 and the sole owner and publisher since 1904. The Madisonian has always been the official paper of the county and has never been relegated to a second place in point of influence and patronage. It has always had a larger subscription list than any other in this or adjoining counties, and since 1908 the list has been maintained on a cash in advance basis. In 1906, the Madisonian took up its quarters in a neat and substantial new home, just a half century after its establishment. The structure is practically three stories in height, when the high basement is considered. It is faced with buff pressed brick and on the façade is inscribed in raised letters The Madisonian. The cost was $8,000 and the new home of this pioneer newspaper ranks among the best and most modern in the state. The plant itself is an excellent one. A late improved press in the basement turns out neatly printed Madisonians rapidly; in the shipping room close by the papers are soon wrapped and ready for distribution by carrier and the mails. The types for the paper are cast and placed in line by the improved Mergenthaler linotype, installed early in the year 1915. The second floor is devoted to the counting rooms, editorial rooms and composing rooms, while the third story is given over to offices. The Winterset Reporter was founded by Wood & Gill in 1885 and first published in St. Charles as the St. Charles Reporter. There it remained ten years, when it was moved to Winterset. 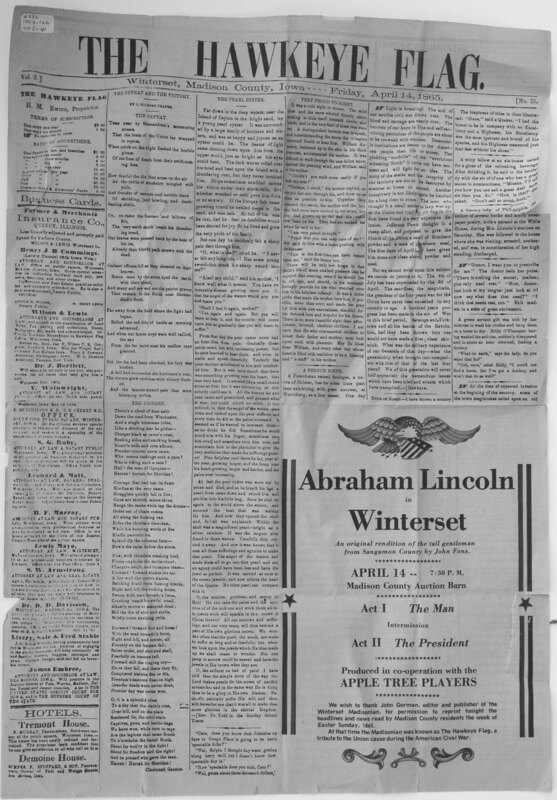 The first issue as the Winterset Reporter made its appearance April 11, 1895. In March 1896, Mr. Wood purchased the interest of Mr. Gill, but within a few days sold a one-half interest to W. F. Payton, who was known as the business manager. This arrangement continued until April 21, 1898, when Ray M. Price became the owner of Paytons interest and business manager as well. During September of the same year another change in ownership took place, S. D. Alexander purchased the interest of A. L. Wood, who had been appointed postmaster of Winterset. Alexander & Price continued the publication of the paper until May 11, 1899, when Mr. Price became the sole owner. January 1, 1903, Mr. Price changed the form of the paper from a six-column quarto to sixteen pages, four columns to the page, which form was continued but three months when the old quarto form was readopted by his successor. Mr. Price died March 23, 1903, and the present owner, J. W. Miller, bought the paper of his estate, taking possession April 1, 1903. 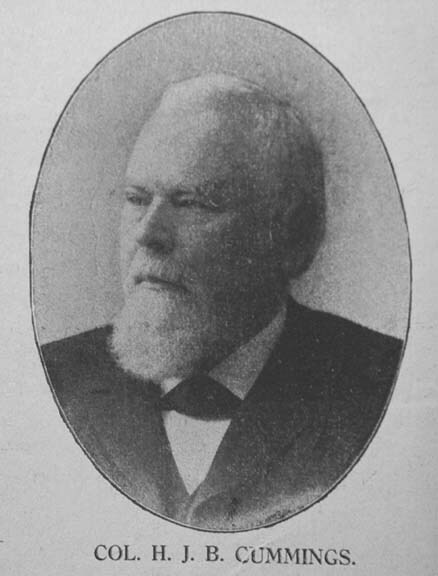 Mr. Miller assumed the duties of publisher and editor as an experienced newspaper man, having been one of the editors of the Madisonian from 1876 to 1887. The Winterset Reporter has always been a stanch and consistent republican newspaper. Each one of its several editors were thoroughly grounded in the republican faith and they have battled fearlessly for the principles of republicanism and the enhancement of the partys interests. Its straightforward and consistent course throughout its career has, no doubt, had much to do with its success, which has been marked. 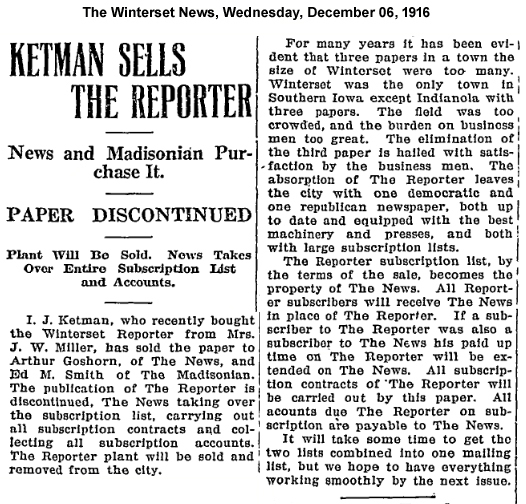 The Winterset Reporter continued publishing until December 1916 when it was sold in pieces to the Winterset Madisonian and the Winterset News. The Winterset News was established in 1872, when Jacob Morgan, who had been foreman of the Winterset Madisonian, bought the plant of the Winterset Sun, a semi-weekly republican paper, from Wilson & Newlon, and changed its name and politics. The first issue of the Sun was September 26, 1868, the publishers being Wilson & Holaday. 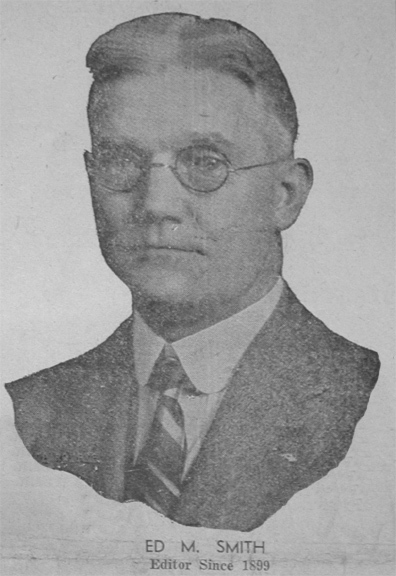 Wilson afterwards went to Des Moines and was the city editor of the Register for years. J. M. Holaday, familiarly known as Milt, was a printer and belonged to a prominent family. The Sun was a five-column folio. Holaday sold his interest in the paper to A. J. Hoisington the following year and the latter in turn sold to William Newlon. The paper did not pay and the plant was sold to Morgan, who issued the first News in the rear upper room of the Jones block, opposite the present building of the News. Morgan's first issue of the News was printed the first week of January, 1872. 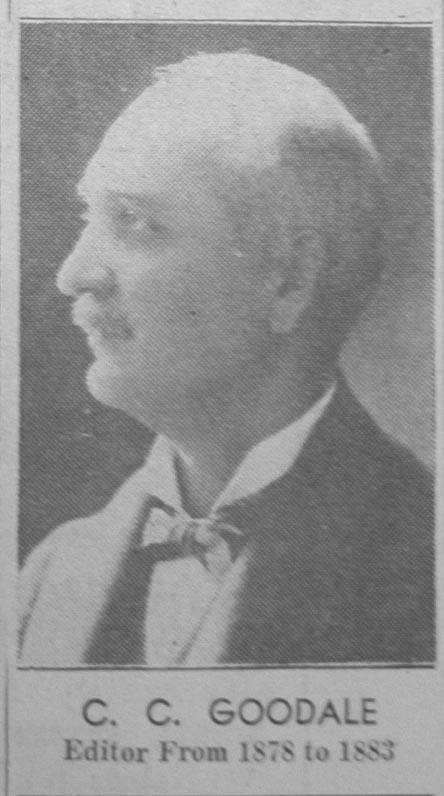 Morgan conducted the paper several years, and after selling out he was connected with the Council Bluffs Nonpareil, published the Kearney (Nebraska) Democrat, and was postmaster of that city during Clevelands first term. In 1876 he sold the plant to Maj. D. D. Palmer, of Iowa City, who published the paper until shortly before his death, having in the meantime sold the paper, March 15, 1888, to Arthur Goshorn, who had sold his own paper in Pierce, Nebraska, to obtain it. Major Palmer changed the News from an eight-column folio to a six-column quarto a year or two prior to his death. The News has always been one of the strongest papers in Southern Iowa. In spite of the fact that 90 per cent of the business men of Winterset have been of opposite political faith since the Civil War, the News has enjoyed their good will and always has been well patronized. The Winterset News was published continuously from 1872 to 1945. 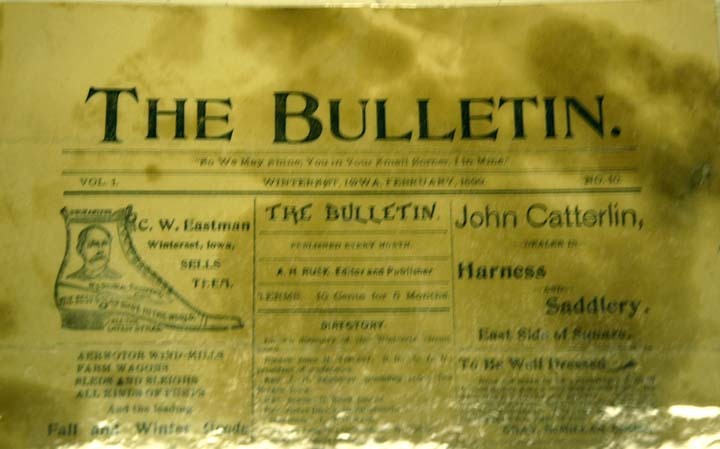 The Bulletin appears to be a monthly Winterset newspaper started by A. H. Rusk in April 1898. The price was 10 cents for six months. The length of time this paper was published is as yet unknown. The only surviving copy is a laminated single sheet from February 1899 in the possession of the Madison County Historical Society. From the 1929 obituary of J. A. Evans, former Madison county citizen..."He became editor of the Winterset Mirror when he bought The Beacon Light, a greenback paper published by Ham Kautzman and changed its name to The Mirror. He sold the paper after two or three years and moved to Nebraska. The Beacon Light was published from 14 Jun 1878 to about 1881. The suspension of the Review was an event that was looked for by men acquainted with the newspaper business in this city. Winterset has no use for four papers and how the Review lasted as long as it did was a marvel. The field in Madison county is none of the best when every little town in the county is plastered with a newspaper and the county seat has four. Deaths are bound to occur in the newspaper family until it is weeded down to something like a legitimate number. While the Review never cut very much figure in the local situation there has been general complaint among the business men on whom the burden falls that we have had and yet have too many papers. The town once before had four papers. Springer & Henry Wallace started the Chronicle, a republican paper about 1880, the NEWS and the Madisonian being the only papers then published in the county. About the same time Ham Koutzman started the Beacon Light, a greenback paper and ran it for two or three years, selling out to Evans, who moved the plant to Nebraska after six months' business at a loss. The Chronicle did not pay and Wallace, who had bought Springer out finally consolidated it with the Madisonian and the plant was bought by the present editor of the NEWS, who took it to Nebraska and started the Pierce Times in 1884. (Coordinator's note: The Review existed for about ten years - 498 weekly issues). Mr. P. S. Wise then started the St. Charles Hawkeye in April, 1895, operating it five or six years with success. He then sold it to D. F. Peffley who lasted seventeen months, giving it up in July 1897. (Editor's note: Mr. Wise must have started the paper around 1890 because the end of Mr. Peffleys reign was documented in the Winterset Reporter, 05 Aug 1897).Then the next owner was Al P. Hass, followed by W. O. Hodgson, Fred Bolte, Otto Engstrom, Mrs. Wilton, Mr. Eldridge, Cope & Long, J. U. Gitzy, and finally Joe Long of Osceola, who sold the outfit to Mr. Eldridge and moved it away. This was at the end of May, 1907. In February 1909, Mr. P. S. Wise started the St. Charles News and is running a bright little country newspaper. The Earlham Echo, a weekly newspaper, was established April 1, 1890 and for many years it was edited and published by A. L. Rowen. Some four or five years ago Paul R. Stillman took charge and is now in full control. Mr. Stillman is quite a young man, but promises to develop the newspaper instinct and nose for news so prominently manifest and known to be characteristic in other Stillmans of the state, one of whom was an able editorial writer on the old Des Moines Register and later, about the breaking out of the Civil War, founded the Sioux City Journal. The son of this pioneer editor is Paul Stillman, editor of the Jefferson Bee, and late speaker of the Iowa House of Representatives. The Earlham Echo ceased publication in 1987. Truro has had two papers, the Graphic and the Star. Neither, however, was published there, nor is one of them left. A paper, taking the title of the Macksburg Record, is edited by Mr. Schell. It is a five-column quarto and is printed at Lorimor. The Macksburg Visitor was published in the early 1890s by Rev. J. E. Beard. The newspaper was not profitable and suspended operations around the end of April, 1895. For some time afterwards, the Madisonian published as section called "Grand River Gleanings," to compensate for the loss of the Macksburg paper. No copies of the visitor are known to have survived. The Macksburg Independent was published from 1916 through 1920 by Charles S. Saiser. Copies are available on microfilm at the State Historical Society of Iowa. 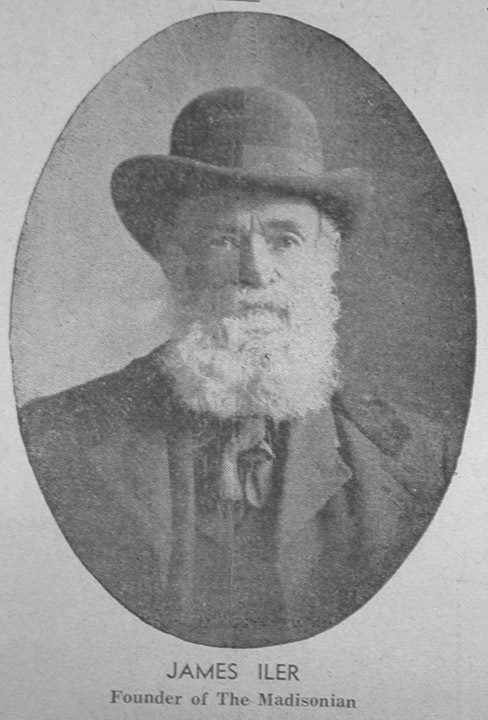 Reference is made to the Peru mail in the 1919 obituary of Albert Brisbane Vines who was noted as editor and publisher of the Peru Mail for 21 years. No other information on this paper has been found. The East Peru Sentinel was published in the early 1890s by Earnest Todhunter. In late April, 1895, Mr. Todhunter left town to possibly settle elsewhere. He sent a letter to his father from Mexico, instructing him to sell the plant and equipment and settle his accounts but the father elected to continue the paper until a buyer could be found. Research by the County Coordinators has turned up at least five other newspapers and we believe there to be others. In November, 1887, the Madisonian made reference to the Earlham Herald. In early 1894, the Madisonian made reference to the Truro Enterprise. In October, 1898, the Madisonian made reference to the Macksburg Ledger. In late 1903, the Madisonian made reference to the demise of the Truro Star which was started in late June 1900. Nothing else is known about these papers and it appears that no copies survived. The Truro News was published by C. P. Shane from 1927 to 1935. This page was created on July 24, 2004. This page was last updated Thursday, 19-Jan-2017 21:37:19 EST .